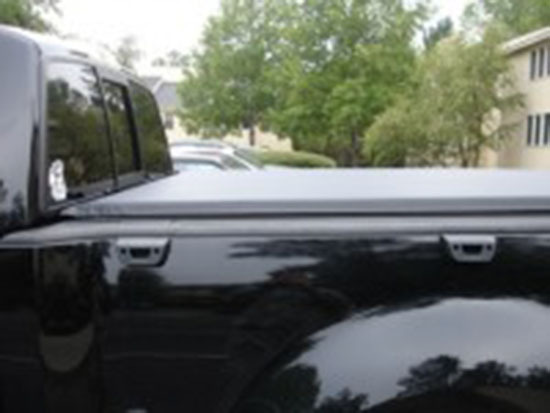 This tonneau cover has an average rating based on 100 customer reviews.
" Flawless. Easy to use summer or winter. No hassles at all. Wife loves the ez-retriever tool for grabbing things that slide to the back of the cab end of the box...no uncovering or crawling in to get them. I would buy another in a heart beat. I have had many other covers through the years and this is the best one yet. Thanks "
" I am delighted with the Access Limited Edition Roll-Up Cover. I will admit that I was a roll-up bed cover skeptic before. The product is a snap to install for do-it-yourselfers and the instructions were flawless. The support struts were tested recently by our recent snow storms in Maryland. 26 inches of wet, heavy snow on a roll-up fabric cover and no sag and no damage at all. I would not hesitate to recommend this cover to a family member or close friend. " " Great cover-well designed and highly functional. " " I love my Access Cover!!! It keeps out the snow and the rain and improves my gas mileage by 2 miles to the gallon. I hook up a trailer all the time and it is no problem to roll my cover. I wouldn't have a truck without one!! " " The second one I have owned. It is excellent in all ways. It stays taut at freeway speeds and is never a problem to unroll for use and to put it back. Once it is set up, I have never had to adjust it. The first one I had 4 years and this one I have had 3 years. Both look excellent after those times, even though the truck is not garaged. " " Works good, easy to put on. Looks great. Have not been able to test if it leaks rain on the road. Seems like it will wear good. I wish you had a hole plug kit that would fill all of the holes in a pick-up bed! I have applied duct tape (to the holes) to keep the road water and dust to a minimum. Delivery very fast. " " Absolutely love my Access Roll-up Cover. It was relatively easy to install, it fits perfect (it looks great, fits ' tight' & completely seals out weather). And driving down the highway there is virtually no "flutter" of the cover from the road wind. My tail gate locks so I can lock "valuables" (i.e. tools, skis, etc.) in the bed of my truck and feel secure. And when you need to haul something "larger" - the cover rolls up tight against the cab and stays secure. I have two friends that also have the access cover and they love theirs ... I would recommend this product. Also, I wish I had bought this cover before spending $1800 on a custom canopy that has leaked since day one!!! " " Did considerable research prior to purchasing this cover. Needed durability, and the flexibility of a soft cover. Have had this cover for almost a year. Was easy to install and looks great. The cover is secure, with a locking tailgate. It is easy to open and close, and does not flap at interstate speeds. Would definitely recommend this cover/brand to others. " " I just had the Access Limited Cover installed and it works great! The craftsman ship is excellent and I love the excellent durability of the product. Thanks! " " Your product is outstanding! I was initially looking for a hardtop roll-away for my 2006 F-150 Supercrew Flareside but found the prices to be too expensive for my needs. When I discovered the Access Limited Edition, I knew it was what I wanted. For the price charged and design, I stopped looking and purchased the cover. After delivery I immediately installed the cover and found that it was not only simple to understand instructions but the ease of installation made my first real custom work on my truck that much easier. Installed, after drilling, within 45 minutes (with drilling about 1 hour) I took it for a drive with out tightening which caused the drumbeat to continue. Rolling up the cover took seconds and tightening the cover to the bed was simple and quick. Unrolling it and locking it back in place sold me even more because it started to rain and allowed me to test the cover and the additional weather stripping added at no charge. Everything worked great. Minor leakage on the sides showed me I needed to fix the rails which took a few minutes and now the bed is airtight and looks great. The slight raise of the rails actually adds to the look of the truck and allows for more room for my dog to move around in when the rain comes and she's in the bed. Agri-cover, you've got a great product here and the customer support was again outstanding! "